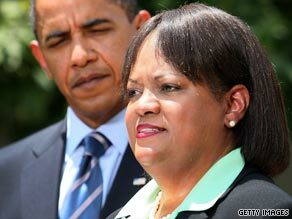 WASHINGTON (CNN) -- President Obama announced Monday his choice for surgeon general -- Dr. Regina Benjamin, a 52-year-old family practice doctor who has spent most of her career tending to the needs of poor patients in a Gulf Coast clinic in Alabama. Dr. Regina Benjamin holds advanced degrees in medicine and business administration. "When people couldn't pay, she didn't charge them," Obama said. "When the clinic wasn't making money, she didn't take a salary for herself." He called Benjamin "a relentless promoter" of programs to fight preventable illness. Benjamin cited the toll of preventable illness as the reason her family was not with her at the announcement: Her father died with diabetes and high blood pressure; her older brother and only sibling died at age 44 of an HIV-related illness; her mother died of lung cancer after taking up smoking as a girl; her mother's twin brother could not attend because he is at home "struggling for each breath" after a lifetime of smoking. "I cannot change my family's past, but I can be a voice to improve our nation's health for the future," she said. Benjamin received a bachelor's degree in 1979 from Xavier University of Louisiana, attended Morehouse School of Medicine from 1980 to 1982, and received a doctor of medicine degree from the University of Alabama at Birmingham in 1984. She completed her residency in family practice at the Medical Center of Central Georgia in 1987. Her medical training was paid for by a federal program, the National Health Service Corps, under which medical students promise to work in areas with few doctors in exchange for free tuition, one year of service for every year of paid tuition. Benjamin founded the Bayou La Batre Rural Health Clinic in 1990 in the fishing village of Bayou La Batre, Alabama, and has served as its CEO since. Like many of her patients, the clinic has suffered its own life-threatening challenges. It was heavily damaged by Hurricane Georges in 1998 and Hurricane Katrina in 2005. It also burned to the ground several years ago. But Benjamin rebuilt it after each setback and has continued to offer medical care to the village's 2,500 residents. Her commitment to them has meant making house calls during the rebuilding, mortgaging her house and maxing out her credit cards, Obama said. "Regina Benjamin has refused to give up; her patients have refused to give up," he said. Many of her family practice patients are immigrants from Vietnam, Cambodia and Laos who make up a third of Bayou La Batre's population, and many of them are uninsured. Benjamin's expertise goes beyond medicine; she earned a master's in business administration in 1991 from Tulane University. But her focus has not been on making money for herself, she said. "My priority has always been the needs of my patients," she said. "I decided to treat patients regardless of their ability to pay." Benjamin said she has worked for years to scrape together the resources needed to keep the clinic doors open and found "it has not been an easy road. ... It should not be this hard for doctors and other health care providers to care for their patients." She praised Obama "for putting health care reform at the top of your domestic agenda," and said she hopes, if confirmed by the Senate, "to be America's doctor, America's family physician." "As we work toward a solution to this health care crisis, I promise to communicate directly to the American people, to help guide them through whatever changes come with health care reform. I want to make sure that no one falls through the cracks," she said. A call to the clinic, where Benjamin was working last week, found it in full swing. "We are just packed in with patients right now, and I'm the only one at the front office," said a breathless woman who then hung up. Benjamin has served as the associate dean for rural health at the University of South Alabama's College of Medicine and as president of the State of Alabama Medical Association, from 2002-2003. She was the first African-American woman board member of the American Medical Association, and she just served a term as chairwoman of the group's Council on Ethical and Judicial Affairs. The position of surgeon general, whose effectiveness is largely in its use as a bully pulpit, requires Senate confirmation.